It was 10 years ago this month that Saratoga Winners, one of the Capital District’s favorite live music venues, burned down in an early morning fire. This Saturday, a reunion is to be held to remember it and the people who made it special. From the outside, Saratoga Winners wasn’t much to look at. It was a two-story roadhouse nestled between the Mohawk River and the Town of Colonie Landfill. There was no pretense surrounding the place, other than having Saratoga in its name, which was technically across the river. Nonetheless, in the years before it closed its doors in 2006, it hosted an A-list of musical acts that rivaled the more polished and refined Saratoga Performing Arts Center. And, that’s where the comparisons end. From the inside, Winners was structured like a barn. Vaulted ceiling, and an exposed wooden frame, including pillars and support beams, reminded one radio personality of a “wagon wheel.” With an open floor layout, patrons had a good view of the band regardless of where they stood. David Byrne, the Ramones, Melissa Etheridge, Ben Folds, the Black Crowes, Wilco and Paul Westerberg were just a few of the names of established stars and up-and-coming artists who drew crowds through the doors. Towards the end of its lifespan, Winners became a home for punk and heavy metal music. Jason Keller was an on-air personality for 103.5/103.9 FM The Edge. He’d take over the Albany airwaves to play classic rock and alternative music once Howard Stern was done with his syndicated broadcasts. He recalled hosting several shows at Saratoga Winners on behalf of that radio station. The on-air host remembered Winners looking like a wooden “wagon wheel.” Despite that observation, it didn’t stop bands from using pyrotechnics onstage. Keller remembered feeling the heat of a “jet engine” ignited from the stage, as he stood across the room next to the soundboard. “This can’t be safe,” he said, with an uneasy chuckle. Regardless, no one was hurt. Keller is now Commercial Production and Station Imaging Director at 102.7 WEQX. You can still hear him on the air, too. 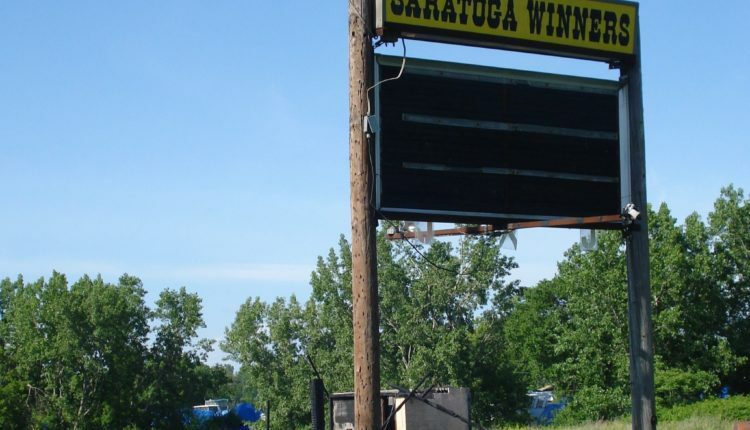 In the early morning of April 30, 2009, firefighters responded to a call at Saratoga Winners. By the time they arrived, it was engulfed in flames. The original call came in shortly after 3 a.m. The Cresent Bridge was closed for about seven hours as eight fire departments battled the blaze. 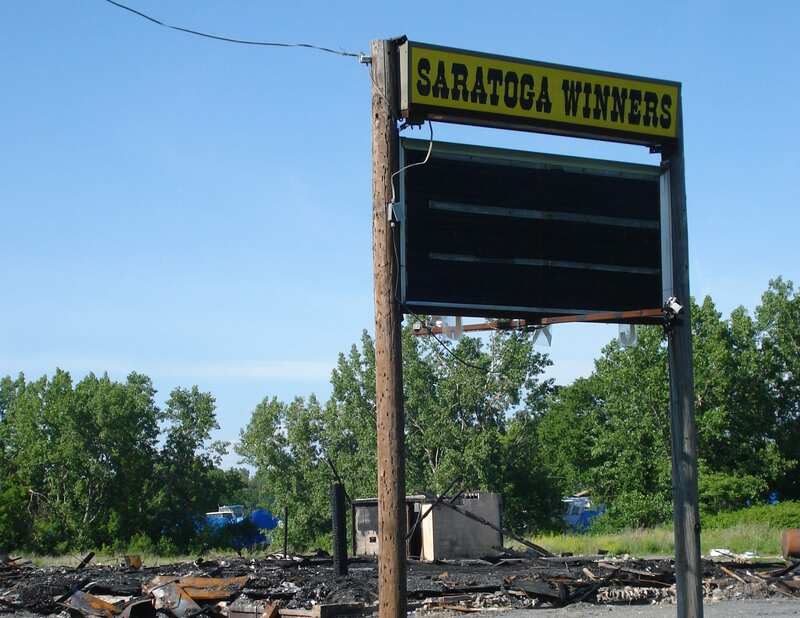 At the time of the fire, Saratoga Winners had been closed for three years. Ownership had changed hands and a new owner reportedly showed interest in returning the venue to its former glory. 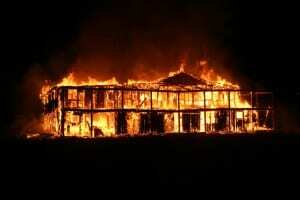 Authorities later determined that the fire was caused by arson. Just over a month later, the owner was indicted for arson, insurance fraud and reckless endangerment. Holly Stah’s memories of Saratoga Winners are more vivid than others. She worked there for eight years. First in the office, then behind the bar. It holds a special place in her heart. It’s where she met her husband, Scott. A big music fan, Stah has collected pictures of herself standing next to Alice Cooper and Billy Sheehan, among others. She likes hard rock enough to recognize characteristics from just the band name, alone. For example, rock bands with an acronym as a name play especially loud. That was proven one night while such a band performed a sound check. Stah was standing near the stage. As the bass player started, she heard a sound from across the room. “Glasses were falling off my trays and shattering on the floor,” she said. “I couldn’t get down to the bar fast enough to stop them from falling off and shattering on the floor. She later shared her observation of bands with acronyms to the owner. One day, the owner thanked her for the advice by sharing a decision he made. He turned down a request to have “D.I.O.” perform. “I thought I was going to cry,” she said, with a laugh. Stah has spent the past year organizing a reunion for people to remember Saratoga Winners and the music that once played there. Saratoga Winners Reunion #3: The Final Chapter will feature music from Untaymed, Divine Right, Maxx Thrust, Bone Box and Enertia at Chrome Food and Spirits on Saturday, April 6, at 4 p.m. The lineup includes bands that had played Saratoga Winners, Stah said. It will capture the spirit of the old place. Something she said she is looking forward to.